WASEONG (5142) forming symmetrical triangle pattern. Immediate resistance @ RM0.88 level. Subsequent resistance @ RM0.905 level. Immediate support @ RM0.86 level. 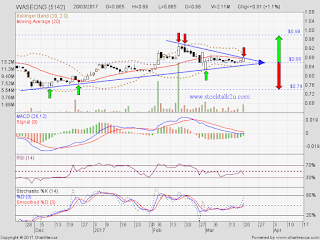 If break up, potential retest RM0.98 level. If break down, potential retest RM0.74 level.